L59, now less than 125 miles west of Khartoum, had two-thirds of the perilous journey behind her. But presently, to the dismay of all aboard, Bockholt turned the great airship around and pointed her nose cone due north—a faint radio signal had just been received from the radio transmitter at Nauen: Break off operation, return. Enemy has seized greater part of Makonde Highlands, already holds Kitangari. Portuguese are attacking remainder of Protectorate Forces from south. “One of the many legends of the Naval Airship Division is that the British robbed Bockholt of success by sending a false recall message in captured German code,” wrote Douglas H. Robinson in his exhaustive study of airship warfare, The Zeppelin in Combat. Robinson, one of the foremost scholars of Zeppelinia, pointedly does not delve into the whys and wherefores of this “legend,” refusing to come down firmly on one side or the other. Mosley, in his Duel for Kilimanjaro, written with the cooperation of von Lettow himself, reports the message as Go back. Newale has been taken. The war is over and the Schutztruppe has been defeated—and states flatly that “the message came from British sources which had set up their own radio station and were in possession of the German code.” Meanwhile, Zeppelin expert Frank A. Contey calls the idea of the British being responsible “unlikely,” stating that they probably couldn’t have “known the code and wavelength of L59’s radio communication.” But the British had possessed the German Naval Code, taken off the wreck of SMS Magdeburg, since the beginning of the war. The cipher masters of Room 40 had long since cracked it and, familiar with its intricacies, could both decipher captured messages and send messages of their own. Given Room 40’s massed-egghead brainpower, that they knew L59’s particular radio wavelength on the night of November 23, 1917, is not implausible. Meinertzhagen later claimed that he alone originated the false recall message sent to L59—and indeed its odor is redolent of the many subterfuges he and his DPM crew perpetrated upon the Germans during von Lettow’s guerrilla campaign against the Uganda Railway in 1915. But Brian Garfield, the great and vigorous Meinertzhagen debunker, deftly puts the lie to this assertion. Garfield points out that Meinertzhagen’s account of his involvement in the L59 caper occurs in the much-revised 1926 version of his infamous diaries and not in the contemporaneous 1917 diary, and that the great fabulist wasn’t even in Africa during the time of L59’s clandestine flight. In fact, Meinertzhagen, suffering from a case of pernicious anemia, had been ordered out of theater by Smuts on November 10, 1916, and after a period of R and R at the luxurious Rift Hotel in Nairobi and an extended spell of home leave, had reported for duty in Cairo on May 24, 1917. By the end of the year, when L59 made her journey, Meinertzhagen was serving in Palestine far from the campaign in East Africa, and could not have sighted the Zeppelin either entering or exiting African airspace at Solum, in Egypt, as he later stated in his diary. This was a full day before the departure of L59 from Jamboli for Africa. How, then, was Bockholt and L59 supposed to reach the embattled Schutztruppe? His instructions in this regard were vague. According to Robinson: “On approaching the East African protectorate, [Bockholt] would endeavor to make radio contact with the troop headquarters, supposed to be southeast of Mahenge, and otherwise was to land northeast of Liwale.” These, as Robinson says, “sketchy directions” were the best available—as there now existed no way to contact von Lettow. On putting the accounts together, it now seems certain (a) that the recall message taken in by Bockholt aboard L59 near Khartoum did indeed originate with the German transmitters at Nauen, but (b) that the message first informing Berlin of the Schutztruppe’s defeat—or at the very least of von Lettow’s retreat from the Makonde Plateau—did not come from von Lettow at all, and (c) that this message was a magnificent piece of disinformation, originating with British intelligence and sent out in German naval code via radio from London or Cairo or elsewhere and picked up by radio operators in Germany. Indeed, the British knew all about the Zeppelin mission far in advance of L59’s departure—perhaps from Woodhall’s mysterious Balkan agent or another source—and had a long time to plan their strategies against her. Van Deventer, now overall commander of British forces in East Africa, mentioned it in dispatches on November 10. (Hoskins, Smuts’s replacement, had been dismissed for “dawdling” in May 1917.) Lord Cranworth complained that he was “awakened during the night to decode immensely long cypher dispatches as to the necessary steps to be taken on L59’s approach.” The handful of creaky BE2cs that constituted van Deventer’s East African Royal Flying Corps Squadron remained, props turning, in a state of readiness for days preceding the Zeppelin mission and “two mountain guns were dug in for L59’s reception” near the Makonde Plateau. The Schutztruppe command has reported to me the most recent feat of arms of the remnant of our East African Army under the command of General von Lettow-Vorbeck. According to the latest news, there seemed to be no way out of their desperate situation and the merciless hounding-down seemed to be drawing to its end. We receive instead the joyous news that the strength of the band of heroes is unbroken, that they still uphold the German flag on the Black Continent, firmly hoping for the victory of German arms in Europe. Only a corps inspired by unreserved trust in their leader and a commander of General von Lettow-Vorbeck’s energy are capable of such an accomplishment, which fills us with pride and admiration, and which is held in esteem even by the adversary. And should in the future the courageous band be overpowered by the enemy, the history of this war will pay tribute to General von Lettow and his troops. May God grant you His aid. After the destruction of the radio equipment at Newale, von Lettow had no way to receive this appreciation. The British themselves sent it through the lines under white flag, in these last days of the Gentleman’s War. But we have gotten ahead of our story. Whatever the source of the recall message received by Bockholt aboard L59 at twelve forty-five p.m. on November 22, 1917, it caused a near mutiny among his crew. To a man, they insisted vociferously the recall message must be false, that the mission must continue. That Bockholt only with difficulty persuaded them to follow orders is shown by the delay of nearly two hours between receiving the recall and carrying it out. At two thirty a.m., the lumbering airship finally swung a wide loop over the Nile and headed north again toward Europe. The journey out, difficult enough with its heat bumps, airsickness, and noxious self-heating canned food, seemed like a pleasure cruise compared to the return trip. The crew, no longer buoyed by hope, adrenaline, and a belief in their mission, fell prey to strange fevers. Sleep became impossible in the narrow confines of their hammocks slung in the keel too close to a noisily flapping panel. Temperatures fluctuated from 82ºF over the Libyan Desert to 14ºF above the Anatolian Highlands. Nearly twenty-four hours after turning around, L59 left Africa behind at the Gulf of Solum. Crossing the Mediterranean proved fraught with vicious storms, though this time no St. Elmo’s fire appeared to guide them on their way. At dawn on November 24, the weather cleared and L59 soared to 10,000 feet over the Gulf of Adalia in northwest Turkey. By two p.m., she had crossed the Anatolian heartland, fishing vessels in the Gulf of Chalona riding the waves far below. Proceeding across Asia Minor after dark, she again lost headway and, as in the Sudan, nearly came to a disastrous end, sinking from 3,000 to 1,300 feet above the mountains north of Ushak. Her nose cone pointed six degrees up, the four remaining Maybach engines running at full power failed to stop the descent. A cold northern wind pushed her down and Bockholt ordered the dumping of 6,600 more pounds of ballast. Again, her antennae weights struck the slopes of the mountain; since they extended only a few hundred feet, here she came perilously close to crashing in the dark. At last, at seven thirty a.m. on November 25, 1917, L59 made her docking station at Jamboli. Her mooring ropes dropped, the ground crew drew her down and walked her into the long shed. China Show had ended in failure. The twenty-two aeronauts, wobbly-legged, nearly deafened by the droning Maybachs at close quarters, stumbled down the ladders to the ground in the gray Balkan morning. They had been in the air for almost four days and had covered 4,200 air miles—the longest distance in the shortest time of any airship to date. 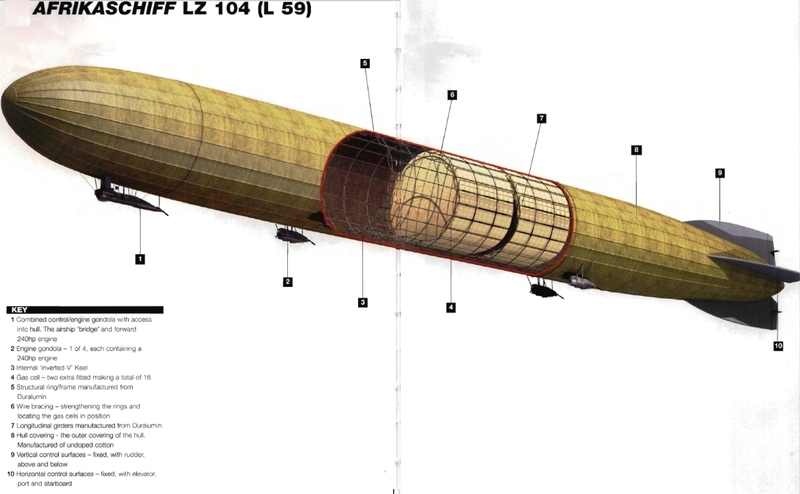 And in truth, they might have gone farther: 19,900 pounds of fuel remained in L59’s tanks—enough to power the Zeppelin for sixty-four more hours of flight—though her hydrogen reserves, reduced by a third, and the lack of sufficient ballast wouldn’t have permitted L59 to reach her maxim range of—say—Chicago. From here the elusive Professor Dr. Zupitza, medical doctor and professor of zoology, disappears from the pages of history. Kapitänleutnant Bockholt, awarded the Iron Cross, First Class, for his Africa exploit (had he succeeded, the Pour le Mérite would certainly have been his), remained in command of L59. His crew, now among the most experienced in terms of distance traveled, remained with him. But what to do with the moribund super Zeppelin? The hulking, unwieldy airship had not been expected to return from her suicide mission. Now she wallowed aimlessly in her shed in Jamboli, deflating slowly like a helium balloon after a birthday party. For weeks her fate, debated between Strasser, Bockholt, naval chief of staff Admiral von Holtzendorff, and the Kaiser himself, floated between yea and nay. Bockholt wanted to try for Africa again, locate the still-undefeated Schutztruppe, and deliver his goods as intended. The Kaiser wanted to send her on a 2,300-mile journey to the coast of Yemen—there to deliver a load of gold and armaments to his Turkish ally, Enver Pasha, just then battling Lawrence of Arabia in the desert. The navy wanted to use her as a scout ship to search for mines in the Dardanelles. Strasser wanted to rebuild her as a bomb carrier, with which to attack England. 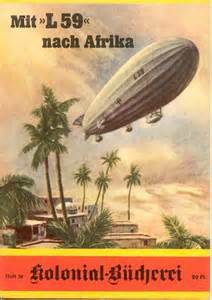 The only purpose, he once more insisted, for which a Zeppelin was truly suited. Bockholt then drew up plans of his own that called for L59 to be converted into an offensive weapon and used against Allied military targets in the Mediterranean—Malta, Port Said, and various Italian cities, including Brindisi and Naples—all hitherto inaccessible to German aircraft. He sent a letter outlining this plan to von Holtzendorff over Strasser’s head, incurring the latter’s ire: To Strasser, such a proposal routed outside the chain of command smelled of rank careerism. But on January 5, 1918, the Kaiser with the naval chief’s recommendation decided in favor of Bockholt, and L59 was refitted as a bomb carrier at Jamboli. On March 20, Bockholt aimed L59 for Port Said on the Egyptian coast, but was driven back by powerful headwinds and returned to Jamboli, bombs still nestled in the keel like so many poisonous eggs. This time, Bockholt ordered a complete overhaul of her engines—they should have been able to deal with the headwind, no matter how strong. Eighteen days later, on April 7, 1918, ready to fly again, the super Zeppelin kicked off her mooring ropes and sailed above the dour Bulgarian landscape, nose cone pointed to the southeast. Bockholt had decided to attack the important British naval base at Malta, via a route that took him across the Balkans and the Straits of Otranto into the Mediterranean. Later that day, at sea, in the vermillion dusk, U53, a U-boat assigned to the German Mediterranean Flotilla, surfaced in the Adriatic off the Apulian coast. Oberleutnant zur See Sprenger, in command, came topside and observed a giant airship flying low over the water, following in his wake. At first unsure of her nationality—the Italians and other Allies now also used airships—he made ready to fire at her with his deck guns. Then he saw the Knight’s Cross emblazoned on her underbelly and the designation L59 on her hull and recognized her for a friend. Sprenger and his gun crew now watched as the Zeppelin overtook them, floating along quite low at only 700 feet, and kept watching as she disappeared, an ominous presence in the Adriatic gloom, bound for parts unknown—though Sprenger figured she might be heading for Otranto, which the German Mediterranean Flotilla had just been ordered to subject to a naval bombardment. Sprenger had witnessed the final end of the famous Afrika-Schiff L59, lost with all hands and all engines in the dark sea at the heel of Italy. Neither the British nor Italians claimed to have shot her down—though how to explain the searchlights? Later, an oil slick was found, a few enigmatic pieces of floating wood, a fuel drop tank; nothing more. The exact cause of her demise remains unknown, but members of her crew had complained of fuel-line leaks, so it is assumed an accident in which a fuel fire ignited the hydrogen and led to her destruction. It would have been better for Bockholt and his ship had he ignored the recall message received five months earlier, despite all the odds against finding von Lettow, and continued his journey to East Africa. He turned back and perished. Though L59’s greatest mission was a failure, her record-making journey from Jamboli to Khartoum, the first truly intercontinental flight of any consequence, is still remembered by aviation historians as pointing the way to the future of modern air travel. This entry was posted in Air Warfare, Aircraft, German Units by MSW. Bookmark the permalink. I doubt that “14000 TONS of bombs were dropped” on Naples. Perhaps 14?